The 2018: Summer of Criminals tour has wound down and now we look ahead to the Riot! We met a lot of great people, drank a lot of great beer (and Mead! ), and we learned a lot. First of all much love to John Gleisner for helping record parts of The Black Hand EP AND for coming along with us to Sheboygan and Racine to fill in for Kevin KC Christensen. You may have noticed we altered the crew section of our website to include KC as well as (bass face!) Mike Ritter. We’ve been fortunate to have them along on so many gigs over the years and then to collaborate with them on The Great War. We’ve sort of held the belief that if you’ve ever rocked a whole set with us you are an official band member (looking at you Nick Lang, Killa Kutz and Ryan Claxton) but when it came down to who has helped us craft our sound and create pathways of polka hip hop as well offering really good advice on gigs etc… well these two guys have been indispensable. We were in full strength at five for a number of shows but we actually (believe it or not) had to do a set without one of our MCs! We got a last minute confirmation of a booking for McCarty Park but our own Spade ONE had a big booking in Detroit! With little time to prepare we took a look at our options. We didn’t want to lose the chance to play in front of a new crowd in West Allis. 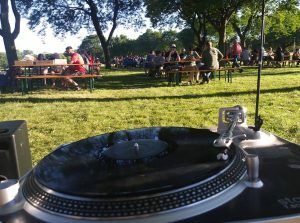 And the other great part of the Traveling Beer Garden was that it was a chance to play outdoors in front of an all ages crowd. This did however mean we had to clean up the act a little… or a lot. So with a third less verses in our songs and 33% of NTSC’s vocabulary censored we had to put together a THREE HOUR SET!!! Could we do it? Of course we could! By combining two abridged versions of a Criminals set sandwiched with a NTSC solo polka set AND a set DJ set of polka records we showed our versatility and ability to cover for each other in order to ensure the success of the group. Kevin and Mike did their thing and smoothed us out and soon we had over a dozen picnic table raising beers and singing alongwith the Beer Barrel Polka! 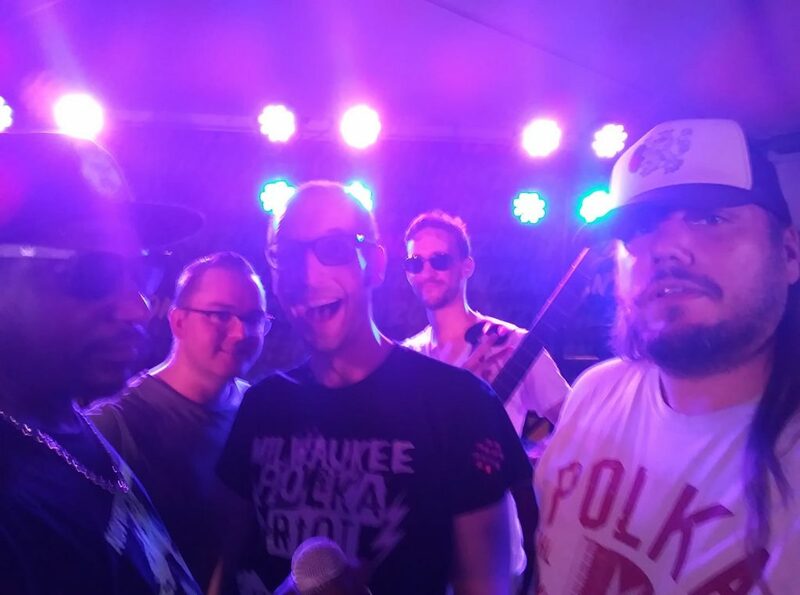 Our gigs Westallion, McAuliffe’s and Bos Meadery in Madison was like visiting old friends even if the Meadery was a first time gig we had plenty of familiar faces with Forro Fo Sho and Swill opening the show! With a three week break from three weeks of gigs we were able to put some of the last touches on three songs for the upcoming EP The Black Hand. We were also very well versed in how we wanted to attack the stage at Brady Street Fest. Being in front of a home crowd of hundreds with people dancing every kind of dance from booty shaking to polka, was one of the most rewarding things we as a band have ever been a part of. We were even able to deal with a last moment change to the set list and make it feel like part of the show. But really rolling with the punches and taking what comes is part of who we are. You don’t have a band like this without being flexible and you can’t be in a band like this without occasionally having to check your ego. It’s not always easy and it isn’t always pretty (I’ve never been called pretty…well maybe my hair) but it always going to be necessary in order for the group to be at its best even when one of us may not be. One last thing… during the world cup we played a show at Nomad Nacional. 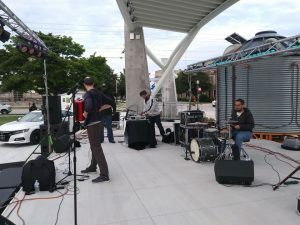 Summerfest was already in full swing AND we were in the middle of a heat wave where we averaged 105 degrees on the heat index… I never felt like we were NOT going to play to our absolute best ability and true indeed the two dozen or so people that came were more than appreciative. To those folks I want to say thanks for crossing the street to see us before you got on the bus! 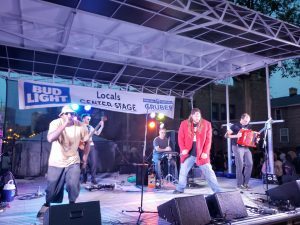 I hope you all make it out to the MILWAUKEE POLKA RIOT! The November Criminals following the hottest gig in town!